In a joint operation, the Andhra Pradesh and Tamil Nadu Police foiled a plot by terrorists to attack the famous hill shrine of Tirumala. After a 12-hour commando operation at a hideout near Puttur town in Chittoor district of Andhra Pradesh, the police nabbed Bilal Malik and Panna Ismail belonging to Al-Umma group, a terror outfit involved in many criminal cases in Tamil Nadu. 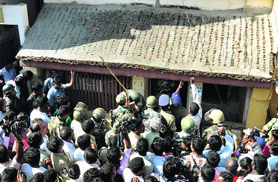 AP Director General of Police P Prasada Rao confirmed that the arrested militants belonged to Al-Umma. The police suspect that they were planning to strike using “umbrella bombs” during the annual “Brahmotsavam” festival at the Tirumala temple. These umbrellas are traditionally offered by devotees from Tamil Nadu. Acting on a tip-off from terror suspect Fakruddin —arrested yesterday — that a group of terrorists was planning to attack Tirumala temple, a police team from Tamil Nadu arrived in Puttur town, about 30 km from Tirupati and 100 km from Chennai. They surrounded a house in which the terrorists were believed to be holed up. A police inspector suffered injuries when he entered the house in disguise and was pulled in by the suspected militants while Panna Ismail suffered bullet injuries when police fired at the house in a bid to bring the suspects out. Soon, a team of Octopus (Organisation for Counter Terrorist Operations) commandos from Tirupati joined in and the forces soon cordoned off the area and lobbed teargas shells into the house forcing the suspects to come out. Three children and a woman also came out of the house. The operation ended with the arrest of the suspects, who were staying in Puttur and had introduced themselves as iron scarp merchants.